Alberta-Ontario Innovation Program Awards Projects | Mentor Works Ltd.
Alberta and Ontario are home to 20 academic-industry research and development projects that recently received government innovation grants. These industry-academia collaborations will help solve key industry challenges in both Ontario and Alberta, increase innovation produced from the country, and diversify and sustain the Canadian economy to compete globally. A total of $36.6 million has been invested into 20 collaborative projects from Alberta and Ontario universities/research institutions through the Alberta-Ontario Innovation Program. Although there are several province lines between Alberta and Ontario, the Alberta-Ontario Innovation Program brings together key contributors in industry and academia from both provinces through strategic partnerships. These partnerships are solving mutual industry challenges through research and development projects. This enhances Canada’s innovation ecosystem, allows for job creation and retention, and increases productivity and competitiveness. 20 projects taking place in Alberta/Ontario have recently been awarded support from the Alberta-Ontario Innovation Program (AOP). The supported projects focus on strengthening Canada’s global competitiveness in areas such as conservation of water and energy, environmental sustainability, integrated manufacturing and assembly processes, waste into energy conversion, and agriculture. More than $36M in Ontario and Alberta provincial funding has been awarded to projects dedicated to accelerating the development of technologies. The Alberta-Ontario Innovation Program (AOP) is managed by the Ontario Centres of Excellence (OCE) and Alberta Innovates (AI). In addition to funding by OCE and AI, select projects received additional support from Emissions Reduction Alberta (ERA), and Natural Sciences and Engineering Council of Canada (NSERC). The Alberta-Ontario Innovation Program’s purpose is to accelerate the ability to commercialize and/or increase productivity through collaborations between industry and Alberta/Ontario publically-funded academic research institutions. The program provides support for businesses in Alberta and Ontario who are accessing research, development, and technology commercialization services. The Ontario and Alberta provincial funding program provides grants from $200,000-$500,000 per collaboration and a maximum of 50% of eligible project costs. Examples of targeted industry sectors that may receive government innovation grants from AOP include: advanced materials and manufacturing, aerospace and defense, energy and environment, health technologies, and life sciences and biotechnology. Please note that applications to the Alberta-Ontario Innovation Program are currently closed. 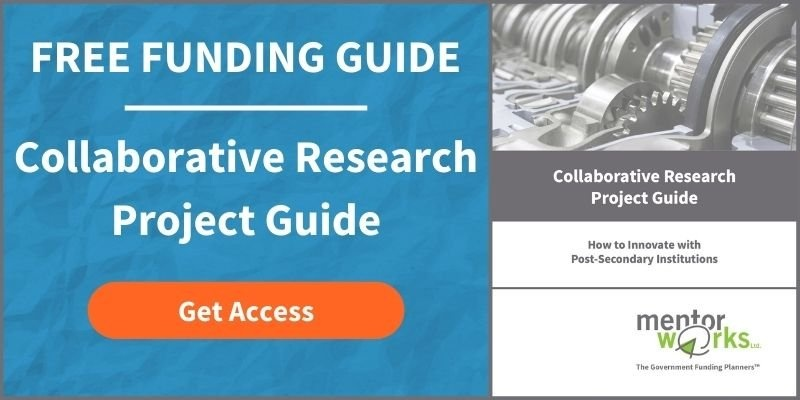 Alberta and Ontario organizations seeking more information about the collaborative research process and how to access government funding for it, please download the Business Guide to Industry-Academic Research Projects.